Honolulu’s Pacific Rim location provides an ideal platform for organizations to meet and conduct business from around the world in a diverse and global marketplace. 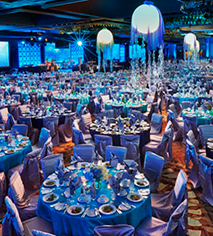 Award-Winning Facilities & Services - Hilton Hawaiian Village® Waikiki Beach Resort offers over 150,000 sq ft of indoor and outdoor meeting space and is the premier meeting and convention resort in the Pacific. But it is not just the superlative meeting facilities that keep groups coming back year after year. It also is the dedication to superior service, meticulous attention to detail, and the vast experience of the event services team. Three Conference Centers - Flexibility in meeting space and guestrooms gives meeting planners more options. Of all the resorts and hotels in Hawaii, this historic hotel has the most space devoted to group use. 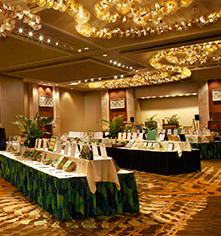 The resort features three independent conference centers – Mid-Pacific Conference Center, Tapa Conference Center, and Kalia Executive Conference Center – all within a short walk to the Hawaii Convention Center. 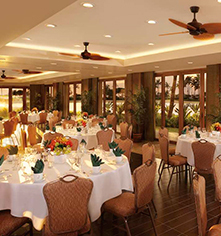 Perfect for Groups of Any Size - With the largest guest room inventory in Hawaii, the resort also offers the largest committable block of guestrooms for groups, up to 1,500 rooms, allowing accommodations for groups of almost any size. The resort offers a variety of room categories and pricing to meet most budgets.